Veto Pro Pac makes high quality contractor hand tool bags. I have never used one myself, but if you read any of the discussions about them on the Internet, you can see what all the fuss is about. So it seems logical that they expand their line of tool bags to try and fill any void. The LT-XL laptop bag is very similar to the XL closed top bag, with a few differences. One being that it can hold a laptop... how obvious. It also has a few other pockets to fit things like your multimeter, or any other delicate testing equipment (ipod). Lets not forget about the hand tools. Just like any other Veto bag, it can hold enough of your hand tools to make you wish you didn't own so many. 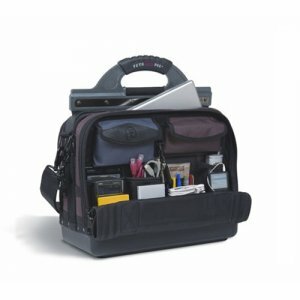 This bag is perfect for the professional audio/video tech, networking tech, or any other tech or non tech that requires a laptop and hand tools. If you dont use a laptop, it can also be used for a clipboard, notepad or binder.